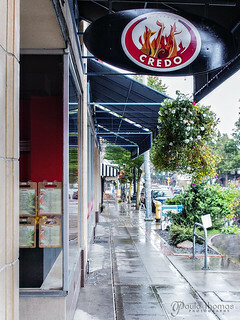 Pizzeria Credo is located in West Seattle on California Avenue. Their rave reviews and gluten free pizza crust is what drew me to try them. I have to admit it's been a couple of years since I've actually had any pizza and this was my first gluten free pizza so this was a real treat I was looking forward to. Their gluten free crust is only an extra $2.50 which is less than what I've seen other pizzeria's charge for gluten free options. Their gluten free crust comes from Great Harvest Bread which is just down the street. They use fresh ingredients and make their own sausage chipoline. 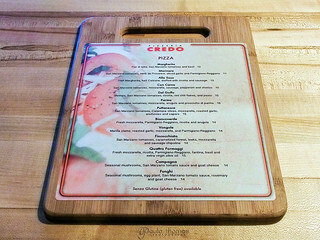 Their menu comes attached to a wooden cutting board and we happened to order an item that was misspelled on the menu (Finocchiata was spelled Fincocchiata). 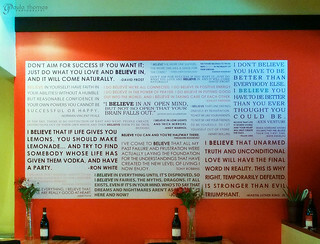 The restaurant was small and cozy and the walls were filled with quotes of all kinds. Since I've never had gluten free pizza crust before I didn't have anything to compare it to other than the glutinous pizza crust I've eaten in the past. Unfortunately, it just wasn't the same. It looked nice and crispy when it came out of the oven and onto the table but it just didn't have the crispiness I was hoping for. 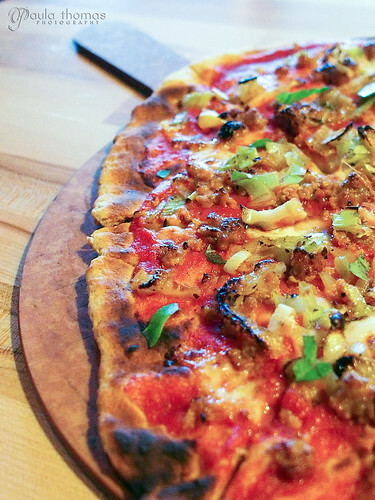 The toppings (San Marzano Tomato Sauce, Caramelized Fennel, Leeks, Mozzarella & Sausage Chipoline) were great though I would have liked more of them. I have the same comment about the gluten-free crust.....it just tasted kind of like a cracker. Not enough toppings. But, the portabello mushroom was amazing!! !